An upcoming luxury condominium in Bukit Timah is positioned to change the way you live – The Asana. Expressly fashioned to exude elegance and sophistication, the 99-year leasehold will be occupying a prime location on Queen’s Road, halfway between the Singapore Botanic Gardens and Rochor River, and near Orchard Road. It’s also a very accessible location since it’s close to MRT stops including the Botanic Gardens Station, Farrer, and Queenstown Stations, as well as chief thoroughfares like PIE, Bukit Timah Road, and Farrer Road. The word “asana” in Sanskrit refers to the various poses in a certain branch of yoga – the ways in which you can position your body so it can be in tune with your spirit. It concerns quieting your mind and attaining the perfect balance of your whole self, so you can unleash the best person you can be. Similarly, the Asana Condominium poses you for inner tranquility and the utmost well-being so you can access the best aspects of yourself. Everything about it – the home design, the wellness aspects and all – condition you to attain an impeccable quality of living. To begin with, the overall plan keeps nature in mind, an homage to the verdure and environmental features found in the nearby nature reserves. The recreational amenities play on water, air and light so you can rejuvenate yourself daily in a way that perks up your body and soul. Take for example the pool area: There’s a 50-metre pool for serious laps, and a smaller pool for a more leisurely swim. Come over to catch some sun and get some good air into your lungs. There are also some al fresco dining pavilions, the sky pavilions, and a sky lounge where you can enjoy the outdoors without exactly leaving home. For your health and relaxation, you can make use of the aerobics room, the indoor gym, the hydrotherapy baths, the spa tub, the onsen, or the steam room. If you have something else in mind, you can make use of the reading room, the piano room, or the pool room. The children, meanwhile, can have fun at the kiddie splash pool or the playground. Whatever you fancy, you can find it close to the Asana. Shopping, dining, picnicking, adventure, sports – there’s a nearby setting for each. At the top of the list is the Singapore Botanic Gardens, a florid urban sanctuary where you can escape to. It’s just within a walk from the condo, and the freshness is sure to uplift your spirit. On those days when you’re in the mood for someplace away from the city, you can go to Bukit Timah Nature Reserve, Central Water Catchment, or Mac Ritchie Reservoir Park. It will only take you a short drive. There’s a wealth of commercial centres within a short distance as well. Dine, shop, or just hang out at Holland Village, Dempsey Hill, Cluny Court, or Coronation Plaza. There are also a variety of dining spots and retail establishments all around. But of course, the most exciting place to go for that sort of fun is Orchard Road. If your idea of recreation involves sports, you can take a look at the activities you can participate in at the Tanglin Club, or the American Club. And don’t forget to consider the Royal Tanglin Golf Course. A well-rounded, and well-maximized life is certainly attainable. The Asana positions you for balance, serenity, and action, so your ideals can emerge as realities. Around this choice address, the best things about living in Singapore converge and unify into a unique, accessible lifestyle. Ask iCompareLoan mortgage broker about how you can compare home loan Singapore so you can get started on your wonderful, new life. Living in the metropolis certainly has its perks and privileges. Think about it: It’s right where the fast-paced city beat invigorates you, positioning you to do ordinary things in a dynamic way. Think of having everything you need at your doorstep, from everyday essentials to the wining and the dining, the glitter and the glitz. But on top of all these, your home in the city has to provide you with an extremely comfortable, restful, private environment where you can lay back and recharge for your next adventure. It also must be a home you can call your own, a place that inspires you and frees you to pursue your dreams. V On Shenton pledges to be such an address. A high-end project of United Industrial Corporation (UIC) Limited, it’s expected to be among the most coveted condominia within our Central Business District. The project is on the rise at 5 Shenton Way (where the old UIC Building used to be), in the area which will soon be Singapore’s Wall Street. It will have a 99-year tenure, and a TOP dated on December 2017. The master plan for V On Shenton reveals a marvel of engineering inspired by the inginuity of nature. The facade is characterized by flowing, organic-looking hexagonal shapes that echo a stylized honeycomb. This honeycomb construction actually serves a twofold purpose: it adds structural stability without being heavy and bulky; at the same time, it gives the building an interesting appearance, making t look like a work of modern art. UIC has chosen highly remarkable and reliable partners for this undertaking. Building has been entrusted to Samsung C&T Engineering and Construction Group, a subsidiary of the internationally-acclaimed Korean comglomerate, Samsung. Meanwhile, the architectural design is the work of one of Singapore’s leading firms, Architects 61, together with the famed Dutch company, UN Studio. The end-result will be a two-building mixed development made up of residential units, office spaces, and shop units. The residences will be housed in a 54-storey condominium building, while the office spaces will be separately located in a 23-storey block. These towers will rise from a 7-storey arcade which will contain 2 levels of shop spaces, 2 levels of basement parking, and 5 levels of above-ground parking. V On Shenton also offers a profusion of lifestyle privileges to its residents, through four levels of leisure amenities. However you wish to spend your free time, these perks will be help make your interlude more relaxing and gratifying. The 24th Floor amenities are collectively named “Epicure”, suggesting a sanctuary for persons who are passionate about food and drink. Designed with the input of Chef Ryan Hong, this is the perfect place to get together with your loved ones over a sumptuous meal. This is place where you can go for a breather and rejuvenate your body, mind and spirit. Here’s where you can come to take things easy so you can easily recharge for the next day. If you need to perk up and shape up, the 35th floor is the place to be. It features a well-equipped gymnasium with a spectacular view of the sea. You can do your cardio routine or tone up with your strength training exercises while enjoying the panorama. It isn’t any wonder why V On Shenton is quickly becoming the most desirable address to live in, even while it’s still under completion. In simple terms, V On Shenton positions you for a life of excitement, glamour, and pure advantage. It’s a situation you won’t regret. Capture your dream by getting ahold of iCompareLoan mortgage broker. Compare mortgage loan Singapore the right way and find yourself a good financial plan. A trendsetter among executive condominium developments is ready to make its mark in the serene locale of Choa Chu Kang, District 23. The new Wandervale EC will be a residential address that grants a steady, serene way of life for its residents, through its affordable pricing, unique location and miscellaneous niceties. This project is a proposed 99-year residential development bi Sim Lian Land. Sim Lian Land is a division of the Sim Lian Group, a well-reputed property development company with over 40 years of experience and noteworthy endeavors. The highly modern Wandervale EC will be situated along CCK Avenue 3, beside Choa Chu Kang LRT and MRT interchange. The site is just a hop from Chua Chu Kang Primary School, and easily accessible via Bunit Timah Expressway, Kranji Expressway and Pan-Island Expressway. The whole property spans over 205,100 square feet, and it will be yielding 9 buildings from 13 to 17 storeys tall. The tentative TOP is marked for sometime 2019. Take your pick among the assemblage of 534 homes. These units will be suitable for a growing family, each having a dynamic floor plan, spacious bedrooms, and trusty appliances. All of them will be oriented in the north-to-south direction, for a good amount of natural lighting and ventilation. The basic three-bedroom apartment is conceived to be efficiently laid-out, with every square foot made usable. These units will be outward-facing, allowing for airy, bright interiors. It will have a large master chambers plus two other bedrooms, which will each be spacious enough to fit a queen-sized bed. This will also come with a useful service yard, a well-ventilated corner kitchen, and roomy family areas. The unit will be fitted with a convenient garbage chute, as well as equipment by Hansgrohe and Electrolux. There will also be the premium three-bedroom apartment, which is designed almost like the basic three-bedroom one. What gives it the “premium” distinction is the slightly larger floor plan, the additional utility room, and the bigger, brighter kitchen. The kitchen will also have glass walls that seamlessly blend it with the rest of the interior space, permitting an easier flow between the food preparation area and the dining room. Finally, the four-bedroom unit, which will be better for even bigger families. It’s laid-out with more generously spaced living and dining areas, a dual kitchen, and a large yard space. The master suite will be extra roomy, with a good-sized wardrobe. Only a small number of these units will be available, so they are quite exclusive. Of course, a home isn’t just about sleeping, eating and doing your chores. You’ve got to have a bit of fun as well – that’s why the developers are making sure to provide a whole lot of them. Go swimming in the 50-metre lap pool, or create some bonding-time by the BBQ area. Grab a buddy to spot you at the indoor gymnasium, or to play opposite you at the tennis court. Got events? Set something up at the clubhouse or the function room. And make sure your little kids get some outdoor activities too, by taking them to the playground. Supermarkets: Prime, Giant, NTUC Fairprice, FairPrice, Great Value, Sheng Siong, TongXingFa Supermarket, Bharath Mini Mart. Shopping centres: Keat Hong SC, Lot One, Green Ridge SC, Teck Whye SC, Sunshine Place. Sports, play and recreation areas: CCK Community Centre, CCK Park, CCK Stadium, CCK Sports Hall, Teck Whye Garden, Warren Golf and Country Club, Limbang Park, Kranji Reservoir Park, Bukit Batok Hillside Park. Others: CCK Public Library, Hai Inn Temple, Al-Khair Mosque. Whenever you need to get anywhere, you can just walk to Choa Chu Kang Station, which is practically next door. You can catch an MRT (North-South), an LRT, or a bus there. The Jurong East MRT interchange (East-West) is just two stations away. Also nearby is the new Bukit Panjang Station (Downtown), which will soon be integrated with the Hillion Mall. Driving will be effortless as well, with the KJE, BKE, PIE, Upper Bukit Timah Rd., Woodlands Rd., and Bukit Batok Rd. just a few blocks from home. The CBD will thus only be a mere half-hour away. Dreaming about a new home that everyone in your family will love? Look no further than Wandervale EC. A home at Wandervale EC surely obtainable, especially if you take the time to compare home loan Singapore first to find which plan will work best for you. Do this with the expert help of iCompareLoan mortgage broker. The general vicinity around Thomson Road is a highly desirable location favored by home-buyers and property developers – and there’s no doubt as to why. The Thomson area in the 20th District is a dynamic juncture of everything you will ever need for modern living, from exciting lifestyle options to everyday offerings. Plus, it features a neighborhood full of character – a pleasurable melange of the contemporary and the classic, with an abundance of stylish commercial and leisure spots as well as humble shop houses. To begin with, you’ll find a broad variety of food choices at Thomson Road alone. Together with the surrounding streets, the whole area is a veritable spread that presents different kinds of restaurants, cafes, hawker centres, and more. Secondly, there are a number of malls that present even more food outlets, and much more than that. You can easily go to Thomson Plaza, NEX Shopping Mall, or Junction 8 for a day of retail therapy, a good meal, or maybe just for hanging out. You can also opt to go to Sin Ming Plaza, Ang Mo Kio Hub, or My Village. In addition, whenever you need to escape from the buzz of city living, you can relax at Windsor Nature Park, Bishan Ang Mo Kio Park, Mac Ritchie Reservoir, or Lower Pierce Reservoir. Singapore Island Country Club is also just a few minutes away. To top things off, there are some schools nearby where your children can receive an education, such as Modern Montessori, CHIJ, Marymount Convent, Whitley School, Catholic High School, and Raffles Institution. That’s the Thomson area in a nutshell. Think about how much more agreeable, more gratifying, and more successful your life could be if you lived in such a neighborhood. Fortunately, there’s a new development coming into the area, where you can settle down and make your next home: 183 Longhaus. The new 183 Longhaus is a mixed-use development by TEE Land, up for construction at 183 Upper Thomson Road. Formerly the location of the Long House Food Centre, it’s the perfect address for giving a boost to your daily lifestyle as well as your business. It’s going to be a freehold four-storey development with 40 residences and 10 commercial spots, set in the midst of a good, low-rise suburban zone. 183 Longhaus will have a residential component, to be comprised of two-bedroom, three-bedroom, and four-bedroom units, topped by 14 exclusive three-bedroom penthouses. Each one is sure to be an beautifully designed, elegantly finished family home, complete with a spacious layout, generous natural lighting, and top-end fixtures. Meanwhile, the building’s ground and basement levels make up the commercial arcade. It will feature 5 shop units and 5 dining units, all of which will be appropriately sized. Your business will greatly benefit at this location, as it’s in a high foot-traffic area where the roads and transport stations converge. It’s going to be a very convenient stop for both pedestrians and car owners who crave a shopping fix or an enjoyable meal. As a resident and business tenant of 183 Longhaus, you’ll have the wonderfully advantageous opportunity to live-work-and-play all in the same address. And even if you don’t have your own retail or eatery business, you would still appreciate the collection of shops where you can conveniently buy your cravings – it’s just a quick elevator ride away from home. You’ll have to agree that 183 Longhaus is indeed a sterling address to invest your money in, particularly since the units are so affordably priced. Perhaps you’re buying a new home for yourself or your family, or seeking for a profitable position for your business, or maybe just choosing a unit to rent out as a source of income. Whatever it is you’re looking for, this all-in-one, mixed development is really something you ought to consider. If you’d like to give it a go, be sure you’re equipped with up-to-date information and an effective financial plan. To accomplish this very important part of property buying, meet up with with a competent mortgage adviser first, like those guys at iCompareLoan mortgage broker. Ask them about how you can compare home loan Singapore without the stress and the hassle. Executive Condominiums happen to be a very popular living choice for Singapore home-buyers, mainly because they give the same quality and comfort as private luxury condos would, only they are much lighter on the pocket. ECs are ideal for people who can’t so easily afford private homes, or perhaps have a harder time fulfilling some requirements, so it’s possible for everybody to reach their home dreams. A new EC comes to District 27, a project of the award-winning Quingjian Realty. “The Visionaire” is a 99-year leasehold, and it will be launched sometime this year. The location is near where Sembawang Road meets Canberra Link, at a 309,400-square foot plot on Canberra Drive. It offers 16 residential blocks that rise between 9 and 11 storeys, as well as a range of amenities for daily leisure activities. The development will be made ready for occupancy by the 4th Quarter of 2018, and for legal completion by the middle of 2022. Apart from The Visonaire’s collection of homes and amenities, you will also have several community activities to look forward to. There will be lifestyle classes and sports activities offered periodically, so you and your household can enrish your lives. You’ve got an extremely delightful suburban setting: it’s far away from the busy metropolis, and surrounded by quietness and freshness. Despite this, the location isn’t at all remote. In fact, it’s only minutes from main routes, including the SLE, the BKE, the TPE, and the CTE – thus, driving to your destination will surely be a pleasant experience. Besides that, the nearby Canberra Station will also be operational soon, within walking distance and connected via walkway to The Visionaire. Until then though, residents can make use of the bus service to Sembawang Station. Northpoint City is a few minutes away. It’s the largest mall in the area, offering hundreds of shops, restos, and others. Also within a convenient distance are Sembawang Shopping Centre, Sun Plaza, and the upcoming Canberra Plaza. You can also consider going across the strait toward Johor Bahru, where you can have a dazzling out-of-town night or a good splurge. A lot of eateries are found in the nearby shopping malls, but don’t forget the many restaurants in the neighborhood or along the beach. Given the location, you’ll be sure to find a lot of seafood restaurants, like HongKong Street Seafood, or Beulieau House and Sembawang Seafood Paradise. But of course, you will also see many of your favorite fastfood stops, like McDonald’s, Subway, KFC, or Sakae Sushi. You can also find bars such as Handlebar, Party World KTV, or JS Bar and Grill. When you’re up for something fancier, you can dine at Sakura International Buffet, or Eatzi Gourmet Restaurant. When you crave something simple but satisfying, go for the wares at Yishun Ring Road Blk 105, or Chong Pang Market. Sembawang Park and Sembawang Beach are near enough to walk to. You can also take a look at the offerings at SAFRA Yishun, Yishun PArk, Orchid Golf and Country Club, Sembawang Country Club, Seletar Country Club, or Admiralty Park. Meanwhile, next door to the Visionaire, the Sembawang Community Hub is right now under construction, soon to offer even more facilities for sports and recreation. Also take not that the nearby Northpoint City will eventually open Nee Soon Community Club – the first Singaporean community club integrated with a shopping mall – as well as a town plaza and recreational amenities. For a special time with your family, schedule a trip to the Upper Seletar Reservoir or the Singapore Zoo. The setting is great for families, as it is safe, serene, and near to many educational institutions. Close by are Canberra Primary and Secondary Schools, Modern Montessori, Sembawang Primary, Northoaks Primary, Ahmad Ibrahim Secondary, Singapore American School, Yishun Junior College, and others. Your older kids can think about getting their college education at Uptrend College (Yishun Branch) or Republic Polytechnic. Khoo Teck Puat Hospital, SAF Yacht Club, Yishun Community Hospital, Race Course, etc. With so many exciting things happening – and still just about to happen – in Singapore’s northern areas, you can’t go wrong with a property investment there. The Visionaire is definitely something to consider, whether you’re seeking a home to live in, or something to rent for income. With the affordable price range and the potential for appreciation, it’s where you belong. And keep in mind, as you plan your purchase, be in touch with iCompareLoan so you can compare home loan Singapore properly. The Best thing About City Living Is … Garden Living? The island state of Singapore is known for remarkable sites like Marina Bay, Gardens by the Bay, and Orchard Road. Places like these offer scintillating experiences coveted by locals and foreigners alike; no wonder properties near these world-class destinations are very sought-after. Everyone wants to live an exciting life, and one of the best ways to do this is to purchase some top-notch real estate. Among the many renowned spots on the island is the Singapore Botanic Gardens – 74 hectares of lush, tropical greenery at the fringes of the city. It has been around for more than a century and a half, and its beauty and charm hasn’t at all faded. The expanse features the National Orchid Garden, the Ginger Garden, the Rainforest Garden, Jacob Ballas Children’s Garden, and other attractions, all in all showcasing over 10,000 species of plants. Collectively, the Singapore Botanic Gardens has been consistently considered Asia’s number-one park, and in recent years it earned honors such as the International Garden Tourism Awards’ “Garden of the Year”, as well as three Michelin stars. Lately, it was recognized as a UNESCO World Heritage Site; it is in fact only one of three botanical gardens and the sole tropical garden in the world to have that distinction. Within proximity to this well-loved, internationally famous park is a residential estate that you will love to live in. The tenth district presents a serene neighborhood marked with elegance and a upscale living, mostly populated by high-class bungalows. By the end of the year however, the area will see its very first condominium, which will certainly be at par with the rest of the neighborhood. 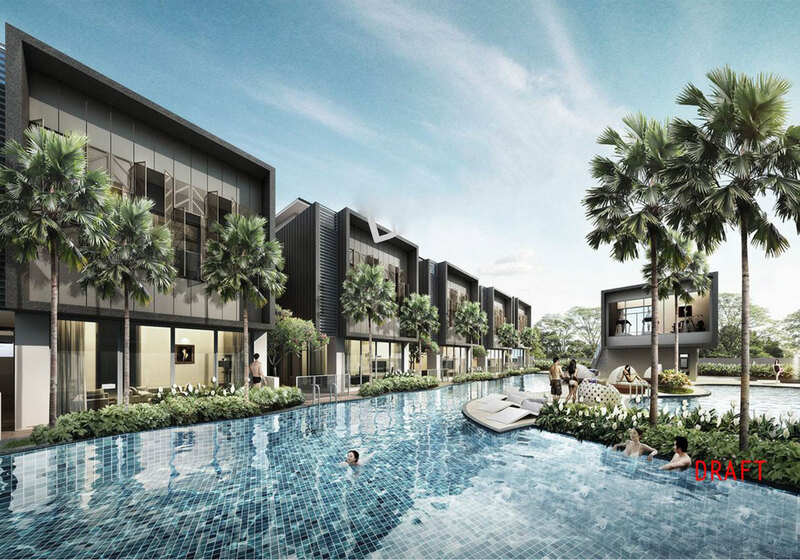 Cluny Park Residence rises at 99 Cluny Park Road, just across the sprawling paradise of the Singapore Botanic Gardens. The select 4,544-square metre site will also have an entrance gate on Bukit Timah Road to permit better accessibility. It’s only a short walk from the Botanic Gardens MRT Station (Circle), and it’s seamlessly linked to Bukit Timah Road, Farrer Road, Holland Road, the PIE, and the CTE. To make your life even richer and more satisfying, Cluny Park Residence comes with a amenities deck, located at the topmost level of the building. As an occupant, you’ll be free to use the gym equipment as well as the infinity pool. From time to time, you may also want to surprise your loved ones with a simple dinner at the outdoor lounge, or set some time for a picnic over the barbecue grill. As an added boon, the site is supremely located in a neighborhood that offers a breadth of basic necessities as well as pleasures and perks. Aside from living virtually next to the most famous garden park in all of Asia, you’ve got easy access to shopping malls, supermarkets, restaurants, schools and others. To start with, you won’t have to go too far for your everyday needs. Just at the corner of Cluny Park Road and Bukit Timah Road is Cluny Court Supermarket. There is even an NTUC Fairprice at Coronation Shopping Centre. Shopping and dining options abound in the general area, as Orchard Road, Holland Village, and Dempsey Hill are each just a short distance away. Even nearer to home are Coronation Plaza and Serene Centre. There are also several restaurants in the area, even a few within the Botanic Gardens. For some delicious hawker food, you can go to Adam Road Food Centre. If you’ve got children, finding schools close to home is definitely one of your priorities. Good thing there are a lot of schools within the vicinity. Within a one-kilometre radius are Saint Margaret’s Secondary School, Hwa Chong Institution, Nanyang Primary School, and Nanyang Junior College. Also close quite by are Anglo-Chinese School, Raffles Girls School, Singapore Chinese Girls School, New Town Primary School, Henry Park Primary School, Ngee Ann Polytechninc, and Singapore Polytechnic. There are also some international schools within a short drivel, like Hwa Chong International School, Tanglin Trust, and Chatsworth International School. Such an ideal situation can be yours – all it takes is some good financial planning. Keep in mind that the location alone is very desirable, and with everything else, there’s a very high demand for an address like Cluny Park Residence, so it’s best to act soon. Have a chat with an iCompareLoan mortgage broker for more details. Compare home loan Singapore with them for your upcoming property purchase, so you can be readier than ready. As Singapore’s North Coast is now being posed for increased economic growth and tourism, property developers seized the opportunity to create unique, elite resort residences in that pristine seaside environment. One such address is Whiteshores, an enterprise of Golden Development Pte Ltd., which is a subsidiary of the ever-trusted Far East Organization. Completed in 2010, Whiteshores is a cluster home development that comes with an indulgent lifestyle. It’s a 99-year leasehold that will delight your senses. Imagine experiencing these daily: flourishing greenery, fresh air, refreshing waters, invigorating sunshine, all just a short distance from the sea. Whiteshores can be found at 213 Ponggol Seventeenth Avenue, amid a tranquil residential neighborhood surrounded by mangroves. It’s located in Punggol New Town, just a short distance from the Punggol Marina and Punggol Beach. This exclusive cluster development features only fourteen detached, landed homes. All units are situated at the edge of an expansive lap pool, creating a luxurious resort setting. Making the environment even more pleasant are the pocket gardens filled with tropical shrubbery. A home at Whiteshores is a spacious private sanctuary with a built-up area of over 5,000 sq ft – some units are even more than 6,000 sq ft in area. It has two levels plus an attic, with 4 or 5 bedrooms. There is even a car porch large enough for 2 vehicles, and a private driveway. Certain units even have an outdoor spa tub, or perhaps a private garden. The spacious layout and the abundant windows ensure that you’ll have a lot of space and light in your home. The indoors will be made even more refreshing by a good view of the tropical gardens. You can live each day as if you were in a lavish resort, with all the niceties offered by the development. Apart from inviting swimming pool, it also has a sunbathing deck, a massage pavilion, a spa pool, a kiddie playground, a rain shower pavilion, and a barbecue and dining pavilion. Spend your leisure time as you would want it: have a cool dip, bathe in the sunshine, or get a relaxing massage; you can also dine al fresco with friends of family. On those days when you crave for more fun, you won’t have to deprive yourself. You can take the whole family for a nice break at the nearby Punggol Waterway Park. You can also go to Punggol Adventure Park, Punggol Jetty Park, Punggol Ranch, Punggol Park, or Punggol Promenade. Of course, there’s also Punggol Marina Country Club and Punggol Beach. When you’re in the mood for malling, you can easily go to Punggol Plaza, Hugang Mall, Rivervale Mall, Compass Point, or Punggol Point. For food and dining, you can check the choices at The Punggol Settlement. Other places close by are Sengkang Sports and Recreational Centre, Sengkang Community Hub, and Sengkang Riverside Park. You can enjoy the convenience of having your children study at a nearby school. If you’ve got pre-schoolers, you can consider PCF Sparklers. Your school-age children meanwhile, can start at Punggol View Primary, Punggol Green, Edgefield Primary, or Mee Toh. Your young teens can continue their education at Punggol Secondary, Edgefield Secondary, Compassvale Secondary, Nan Chiau High, or Sengkang Secondary. If you would like your daughters to benefit from a school exclusively for girls, you can enroll them in CHIJ St. Joseph’s Convent. Whiteshores is quite near to medical facilities such as Pasir Ris Polyclinic, Ren Ci Hospital, and Changi General Hospital. Punggol New Town is very accessible through Kallang-Paya Lebar Expressway, Tampines Expressway, and Central Expressway. With that, it will take you a mere 20 to 30 minutes to drive to the CBD. The nearest train stations to Whiteshores are Punggol MRT / LRT, Sengkang MRT / LRT, and Buangkok MRT. Whiteshores offers a rare opportunity to live in your very own resort-themed home. It brings together a combination of the most pleasurable elements – tranquility, water, greenery, and others – and furnishes it with modern comforts. Life can’t get any better than this. Want to buy an amazing home in this splendid milieu? Compare home loan Singapore with iCompareLoan mortgage broker. “White Cove” — the name alone evokes notions of serenity and freshness; of crisp, sunny days and cool waters. This is the name of a new residential resort by Tai Lai Holdings, slowly unfolding in Punggol’s Northshore district. The 103-year cluster development will surely raise the bar for waterfront living, offering a tropical getaway minutes from the city. The location for White Cove is along Ponggol 17th Avenue, in the tranquil seaside locale of District 28. This North Coast address is just across Samudera LRT Station, and close to the Punggol MRT Station. It’s also very near the Marina Country Club, Punggol Beach, and the Punggol Waterway Park. Among the nearest routes are the KPE, the ECP, and the PIE. The site is situated in the neighborhood of Punggol, which is right now being transformed into a waterfront residential town. Punggol is intended to become the creative hub in the area, and even the country’s first Eco Town. In addition, many major improvements are lined up for the North Coast. Among the new things to look forward to in the next few years are the North Coast Innovation Corridor and the Seletar Regional Centre. Of special interest to residents is the upcoming LRT station which will be connected to the Punggol Promenade via a landscaped, elevated walkway. The plan for White Cove is similar to that of a first-class beach resort: pristine structures swathed in lush, tropical greenery, located near the soothing murmurs of the sea. At the heart of it will be a sprawling leisure pool, accented by cabanas and other niceties. Seventeen villa-style homes will be arranged around the pool. Stunning specimens of modern architecture and interior design, every home will have two floors and spacious layouts. These each come with six bedrooms, a rooftop recreational deck, a two-car garage, and a private driveway. Expansive picture-windows will bring the surrounding greenery into the home, complementing the already-gorgeous interiors. To maintain the residents’ privacy, windows will be fitted with designer screens. Apart from the pool and the cabanas, there will be other wellness and recreational facilities at White Cove. You can live every day in sheer luxury. Swim, sunbathe, or sit in the shade – the pool area and deck will let you do just that. There will also be amenities for your children to enjoy, namely the wading pool and the play area. They can have a bit of physical activity while having a lot of fun. For other forms of relaxation or recreation, you may make use of the gym and the spa deck. You can also enjoy the landscaped gardens and the water wall. White Cove is near to a lot of sites that will keep you in touch with nature. Just a few blocks away is a park connector called the Northeastern Riverine Loop. You can explore it on foot or on your bike as it takes you from Punggol Jetty all the way to Punggol Park, passing by Sengkang Riverside Park, Lorong Halus Wetland, and Punggol Promenade. Also nearby is Punggol Road, which is being converted into a heritage trail. The 1.5-kilometre stretch is going to be a safe place with a beautiful view, where you can take a stroll, jog, or go biking. Apart from the parks already mentioned, there are a lot of other places where you and the kids can go on the weekends. You can look forward to hours upon hours of fun at Punggol Point, Punggol Marina, Coney Island, Punggol Beach, or Punggol Ranch. Despite being near the sea, you will find that there are a lot of places to shop at in the North Coast. It will only take you a few minutes to drive to Punggol Plaza, Rivervale Mall, Compass Point, or Greenwich V. There’s also an upcoming shopping complex called Waterway Point, which will be conveniently situated at the town centre. Among the nearest schools are Punggol View Primary, Punggol Green Primary, Horizon Primary School, Edgefield Primary, Edgefield Secondary, and Punggol Secondary. Also within reach is Meridian Junior College. A home is an investment that will last the rest of your life, so why not choose the dreamiest dream home you can afford? With its ideal setting, you can’t get much dreamier than White Cove. And as far as affordability is concerned, you can afford pretty much anything with the right financial plan. That’s where iCompareLoan mortgage broker comes in. Tell them about your dream home, and they’ll help you compare mortgage loan Singapore to help you achieve it. In an upmarket residential neighborhood now rises The Nassim, an address that brings together all the best of Singapore. Situated between a verdant paradise and a world-class shopping district, The Nassim is going to be an eco-friendly boutique cluster complex with freehold landed homes. Already, it has earned the BCA Green Mark Gold Plus for its thoughtful concept. This development is brought to us by Capitaland, a leader in Singapore real estate. 18 Nassim Hill is on its way to yield fifty-five of the most elegant terrace houses in the area. These will exhibit stately architecture in the colonial style, to be made even more stunning by a black-and-white color scheme. The impressive design is the brain-child of Mok Wei Wei, of the famed W Architects. The collection of units features apartments with three, four, and five bedrooms. These will all have bright, airy spaces, made even roomier by an expansive balcony. In them will be found perfectly polished interiors, made complete with high-end appliances. Apart from these already-ritzy apartments, there will also be two exclusive unit types that heighten the privilege even further. Among these will be the pool-side Pavilion House. The Pavilion House will have a 9,000-square foot floor area, to contain five bedrooms, among others, plus a three-car basement parking garage in the basement level. The most remarkable unit in The Nassim, however, will be the Regent House. With two floors and a 9,300-square foot area, it will have five bedrooms, family areas, a private lift and a private pool. It will also feature a basement garage large enough for five vehicles, plus a chauffeur’s room. The Nassim will be offering options for your pleasure and enjoyment. These will include a clubhouse, a gym, a communal swimming pool, an outdoor spa tub, and a barbecue area. There shall also be garden areas, a reflective pond, and sky bridges decked in uplifting greenery. For the children, there will be a playground and a water play area. To make your lifestyle even more relaxed, the development will also have underground parking. The surrounding locale abounds with various destinations for all kinds of recreation, from shopping malls to parklands. To begin with, it’s just a skip from the dazzling Orchard Road shopping belt and its host of shopping malls, department stores and boutiques. That’s where you’ll find ION Orchard, Tanglin Mall, Forum the Shopping Mall, and many others. You’ll encounter a variety of brands, from unpretentious local merchandise to the classiest international labels. Also in the vicinity of Orchard are a lot of hotels, a number of cinemas, as well as a variety of restaurants and hangouts. In the opposite direction from The Nassim is the glorious expanse of the Singapore Botanic Gardens. It’s a refreshing, tropical escape nestled in the heart of the metropolis, where you can encounter the National Orchid Garden, the Ginger Garden, Jacob Ballas Children’s Garden, Symphony Lake, and more. It also offers a number of eateries. Also within a few minutes’ drive from The Nassim are Dempsey Hill, Holland Village, Raffles Town Club, and the Tanglin Club. If you have or are planning to have children, you will find the location ideal, as there are several schools near The Nassim. Among them are Raffles Girls School, Anglo-Chinese School, There are also many international schools, such as International School Singapore, Chatsworth International School, Eton House International Pre-School, and Avondale Grammar School. Living near reputable medical facilities can be a real advantage. In this neighborhood, you’ll be near a lot of them: Mount Elizabeth Hospital, Gleneagles Medical Centre, Camden Medical Centre, Singapore Medical Centre, and other hospitals and clinics. The Nassim is a high-end freehold address in a prime location, ushering you toward a lifetime of affluence and inspiration. Generously spaced homes, invigorating perks, and proximity to Singapore’s best offerings – these are just some of the things you can enjoy on a daily basis. Naturally, such an amazing residence won’t come so cheap. But don’t you worry: all you’ll need is a mortgage plan that can make your purchase more feasible. Compare home loan Singapore so you can find the one that works for you. Do it with iCompareLoan mortgage broker. Far East Organization presents an incomparable, all-in-one address in Park Suites. It is going to be a mixed-use 999-year development, complete with a commercial podium as well as a residential component. Apart from that, its site is centrally located in District 10, right at the hub of a multitude of shopping, dining, and lifestyle destinations. Park Suites is expected to become an exciting landmark that will radically change the social landscape. To be completed within the next few years, the project will be handled by Far East Organization’s ancillary company, Kentish View Private Limited. Effortless Access To Everything You Need! Holland Grove Road stretches from Mount Sinai road to Holland Road. Holland Road, in turn, connects to Farrer Road and Clementi Road, which both lead to the AYE and the PIE. That said, you can easily drive to any place on the island. If you prefer to ride a public vehicle, however, you can take a bus at Mount Sinai or Holland Road; you may also ride the MRT at Holland Village (Circle Line) or the Buona Vista Interchange (Circle / East West). At Park Suites, you’ll be living mere moments away from several places where you can shop, dine, or have some fun. Within walking distance is Guardian Jelita Shopping Centre, which has retail stores, services, a pharmacy, and a huge Cold Storage supermarket, among others. On those days when you crave fresh or cooked foods, you can stroll over to Ghim Moh Market and Food Centre. Holland Village will only be a five-minute drive from home. The area offers a cluster of options that includes Holland Village Market and Food Centre, Holland V Shopping Mall, Holland Road Shopping Centre, Cold Storage, and a vast variety of shops and eateries. If you love food, you’ll be glad to live so close to Dempsey Hill. It isn’t just a place, it’s a gastronomic experience. It will delight you with its conglomeration of restaurants, bars, and cafes, as well as its retail stores and services. Other nearby destinations include Singapore Botanic Gardens, Rochester Mall, Star Vista, and Ulu Pandan Community Club. It will also take you but twenty minutes to get to the myriad shopping and leisure choices of Orchard Road. Park Suites is designed to be an all-in-one community, so you really won’t have to go far for a day (or night) of fun. Although it will only be a mid-rise apartment building, it will span the length of several blocks, arcing around an open space that will serve as a public park. Of the four storeys, the first floor will be a commercial centre with retail stores and restaurants. The other floors, meanwhile, will be comprised of 125 luxury apartments. You can contentedly reside in a lavish home on the second, third, or fourth storey, then come down to the ground floor any time you crave a cup of designer coffee or a sumptuous meal. Wouldn’t that be awesome? Park Suites is a place where you can carry out the live-work-play routine each day of your life – and there’s even so much more you can do! Locals, PRs and foreign buyers are certainly welcome. For free financial advice and an easy way to compare home loan Singapore, set a meeting with iCompareLoan mortgage broker soon.